Paper up to 4" x 9"
1 PMS color printed on Side 1 of uncoated 100lb Natural Linen stock. H4 business card slits on right pocket. 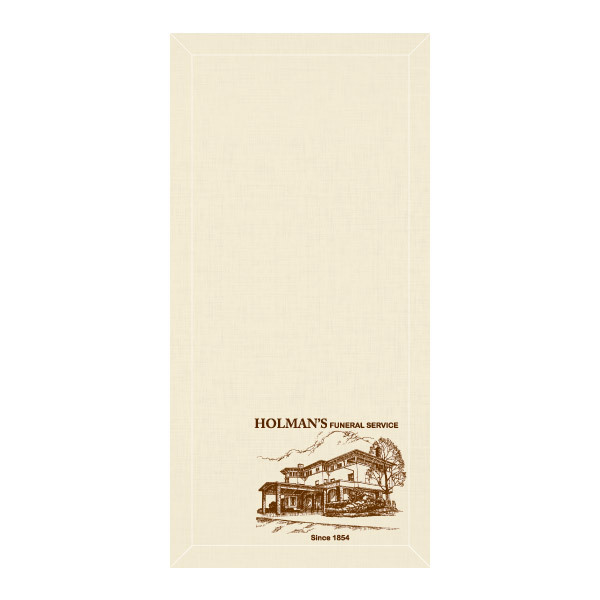 Holman's Funeral Service presents documents to grieving families with this tasteful, minimal design. Calming earth tones in the dark brown ink and natural, unbleached linen stock are reserved while offering a sense of hope and peace. A simple line illustration depicts the funeral parlor, its name, and year of establishment; its hand-drawn style creates a homespun feel that comforts the viewer and sets the tone for personalized, respectful service. Thanks to its Conformer® technology, this product can expand to carry a large quantity of small print media. Both interior pockets hold 4" x 9" brochures, rack cards, or tri-folded letter-size paper. Expansion scores allow the panels to lay smooth and flat whether you're storing one sheet of paper or carrying the maximum 1/2" capacity. Customize your design with branded information, photos, illustrations, or original text. Dimension Closed: 4 1/2" x 9 1/4"
Dimension Open: 9" x 9 1/4"
Acceptable Insert Sizes: up to 4" x 9"